In 1990, Brazil undertook the challenge of reforming the mental health care system. At that time psychiatric hospitals were receiving more than 75% of federal funding for mental health. Low quality institutions with serious human rights violations predominated, and coverage of community-based mental health services was still very low (0.21 /100,000 inhabitants). The country sought psychiatric reform to decentralize mental health care by promoting community services, primary care integration, and residential and social support programs. Since I left hospital my life improved a lot. I have my freedom and I am very happy. I make drawings…Here in the Residence we all do our chores. Implementation of Mental Health guidelines to Primary Care. Creation of specialized centres to support Family Health teams (NASF) in Mental Health Care and to improve their relationship with other services of the Psychosocial Care Network. e-learning tools for primary care workers [“Caminhos do Cuidado” (Care Pathways) trained more than 216000 professionals] and for mental health professionals (about 10.000 participants), between 2014 and 2015. Sharing of experiences and expertise between different mental health teams [“Percursos Formativos na RAPS” (Formative Pathways in Psychosocial Care Network) had 1600 participants in 2015]. A political context of democratization with political will to implement the reform and continuity of its programmes over the years was key to the programmes success. A strong social movement - involving universities, health professionals, politicians, users and families - promoted the reform. A participatory, democratic and progressive process of psychiatric deinstitutionalization involving the three levels of government was key for the implementation of the programme. The process started from a few municipalities and through a bottom up approach, spread to the nation. Brazil has had a federal law which sets out the rights of people with mental disorders and reorients the mental health care model in order to serve their needs since 2001. 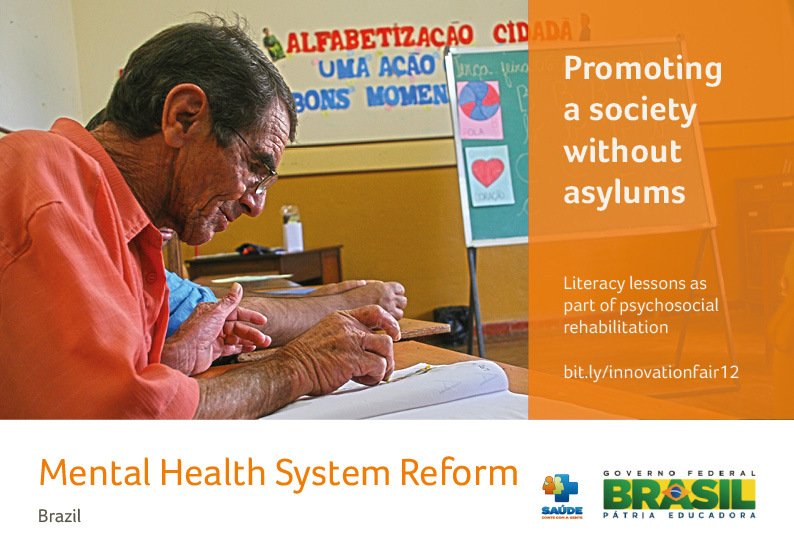 The legal framework, along with social participation, ensured the implementation and sustainability of the Brazilian Mental Health Reform. The Brazilian Mental Health System Reform includes an assessment to identify the psychiatric hospitals with the worst operating conditions in order to prioritise their closure. In addition, there is a process of negotiation and planning with local authorities and providers to gradually replace psychiatric beds with community-based services. A census of psychiatric inpatients guides their reintegration into their families and communities, with support of residential and mental health services. 3. Promote training, technical and financial support to change mental healthcare paradigm. Health professionals, managers and family members need to understand the guidelines of the new system, and mental health practices must respect and promote the rights of service users. Mental health teams need to prioritize practices such as recovery, rehabilitation, social inclusion and empowerment of users. Note: The Mental Health System Reform in Brazil has not been systematically evaluated. All mental health services authorized by the Ministry of Health cost $247 million USD in 2015. In 2015 the total federal spending on mental health (US $ 335 million) represented 1.3% of total federal health spending. Nowadays, more than 79% of federal funding for mental health is allocated in community-based services and there was a reduction of over 50% of psychiatric beds country-wide (51,393 in 2002 to 25,988 in 2014). On the other hand, coverage of Psychosocial Care Centres increased over 4 times (from 0.21 to 0.90 / 100,000) and Primary Care coverage reached more than 64% of the Brazilian population. A recent nationwide population-based study shows that most people diagnosed with mental disorders in Brazil are treated in outpatient public health care services (IBGE, 2014), such as primary care units, which meet 33% of common mental health problems. Assessments of Psychosocial Care Centers (CAPS) indicate that, in general, these services have been fulfilling their role: high user satisfaction (Kantorski et al., 2009; Campos et al., 2009; Surjus et al., 2011), significant reduction in crisis, fewer psychiatric hospitalizations among users in more intensive and longer care and reduction in medication use (Tomasi et al, 2010). The “Going Back Home” Programme has benefited 4,349 people from 2003 to 2015, through monthly payments, directly to the beneficiaries, for a period of one year or more. Another breakthrough concerns the empowerment of users and families in mental health, with the organization of nearly 100 user associations. Brasil. IBGE (2014). Pesquisa Nacional de Saúde 2013: acesso e utilização dos serviços de saúde, acidentes e violências: Brasil, grandes regiões e unidades da federação / IBGE, Coordenação de Trabalho e Rendimento. Campos RTO, et al (2009). Avaliação da rede de centros de atenção psicossocial: entre a saúde coletiva e a saúde mental. Rev. Saúde Pública. 43( Suppl 1 ). Surjus L, Togni S, Onoko R (2011). A avaliação dos usuários sobre os Centros de Atenção Psicossocial (CAPS) de Campinas, SP. Revista Latinoamericana de Psicopatologia fundamental; 14(1). Mental health systems in countries: where are we now? The mental health system in Brazil: Policies and future challenges. A methodology to strengthen communities, by addressing the bio-psycho-social-spiritual dimensions of individuals.